The Consumer Guide Automotive Awards were created to help consumers select the best vehicle for their needs. Every year over 150new vehicles are test driven and measured on multiple factors. Based on objective ratings and dollar value compared to other vehicles in the same class, Best Buy award winners are chosen. absorbed into the Toyota lineup. It has won the Best Buy title for the Subcompact Car category with high marks for fuel economy, driving dynamics and standard equipment not found on other models in the same class. This new model is equipped with rearview camera, cruise control, keyless entry, automatic climate control and a 7-inch multimedia touchscreen with voice recognition. Winning the Best Buy title for the Compact Car class, the Toyota Prius gas-electric hybrid impressed the authorities with its fuel-economy, a variety of practical features and all-around comfort. 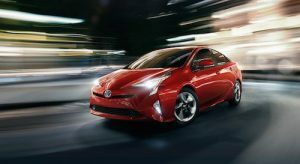 New features on the Prius include Toyota’s Safety Sense package with forward collision warning, lane departure warning, adaptive cruise control and automatic high beams. All of these standard features. combined with a sportier look and feel contributed to the Best Buy win for this model. The Toyota Highlander 3-row midsize crossover SUV was recognized for its expansive passenger and cargo room. An abundance of family-friendly features, remarkably quiet cabin and availability of a hybrid powertrain all set this model apart from the crowd. New model updates and interior enhancements have elevated the 2017 Highlander to a new level of comfort and convenience. Consumer Guide editors also found the driving dynamics of the new Highlander to be more than adequate for a vehicle of its size. We invite you to come test drive these award winning vehicles at our Rochester Toyota Dealership . Our new Toyota inventory includes a selection of new 2017 Toyota Yaris iA, Prius and Highlander models to choose from.